I passed this one on the way up the Tor this morning, clutching ipad and cigarette close to ward off any psychological or physical effect of being out on a fine Sunday morning, up a stunning natural feature of the landscape with the best views for miles around. He didn’t even say good morning when I passed and wished him the same, which in my extensive experience is pretty unusual for visitors to Glastonbury Tor. I imagine he was distracted, updating a spreadsheet: ‘Tor: done’… ‘Stonehenge: pending’. 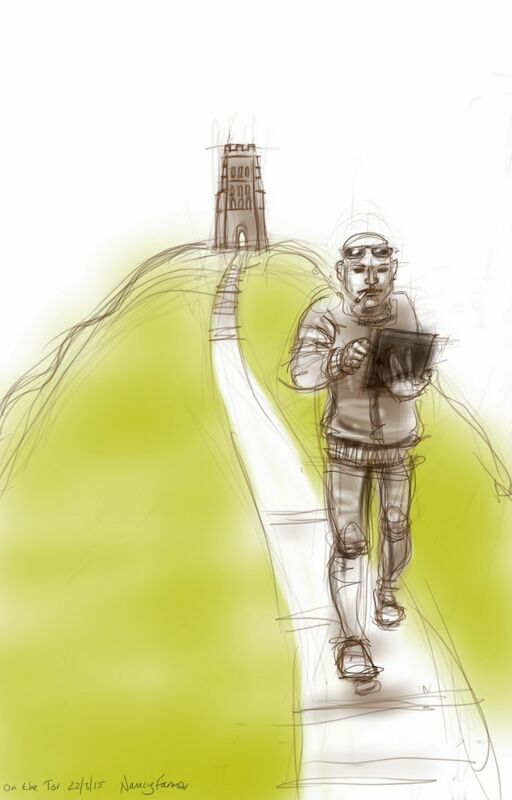 This entry was posted in People, Places and tagged art, Church, drawing, Glastonbury, Glastonbury Tor, illustration, people, sketch, somerset, walking on March 22, 2015 by Nancy Farmer.